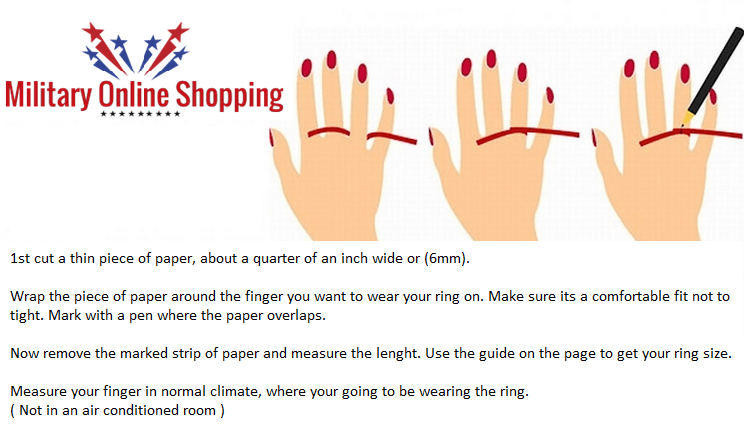 This is how to measure your ring size online. It is purely an indication and one handy method of getting the size you need. The best method is to get a proper ring sizing tool, or pay a visit to the local jeweller. A good jeweller will have no hesitation in providing this service for you. To carry out the process all you will need is the following; A scissors, a ruler, a pen and some paper. When you have measured the length on the strip of paper. Use the following chart to determine your ring size. Rings also come in half sizes, the measurements of which, of course, will fall somewhere in between the whole sizes. The image and information about how to measure ring size online is designed to be helpful. It offers you a second option when you really can’t get to a jewelry store. For military rings we advise you to allow a half size extra, as these rings are made with a wide band. If you have very large fingers size your ring, so that it can move over the knuckle without to much pressure.